The fourth DLC "Contraption Workshop" for Fallout 4 extends the building possibilities in your settlements to machinery, conveyors, elevators and more. 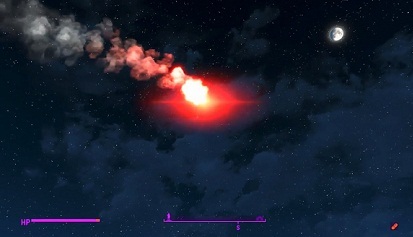 There is now Fireworks that allows you to change the weather or call for reinforcements in the form of the Minutemen. We show you how this works. Emergency Rocket: Get reinforcement in the form of the Minutemen to the launch site. - Clear sky: Provide a cloud-free, clear sky. - Radstorm: Provide a nuclear storm. - Rain: Ensure pouring rain. You can produce Fireworks on a conventional laboratory station. For the normal rocket and emergency rocket you need Glue1x, Fabric 1x and Fertilizer1x for preparing each, For clear sky you also need 1 gold, in addition to Radstorm, Nuclear Material 1x and rain 1x Silver. After installing the DLC "Contraptions," the Fireworks mortars can be found in your shop menu under the item energy- Other. You can find it either build in a version in which it fires straight up or at an angle. The construction will cost you wood 2x, steel 2x and asbestos 1x. Put it on an open area of your settlement and then interact with it. Now you can move the various fireworks above the trading window / showcase. Shortly thereafter, the missiles are automatically fired in order, as you have also laid them. How it works in practice, shows in the following video.